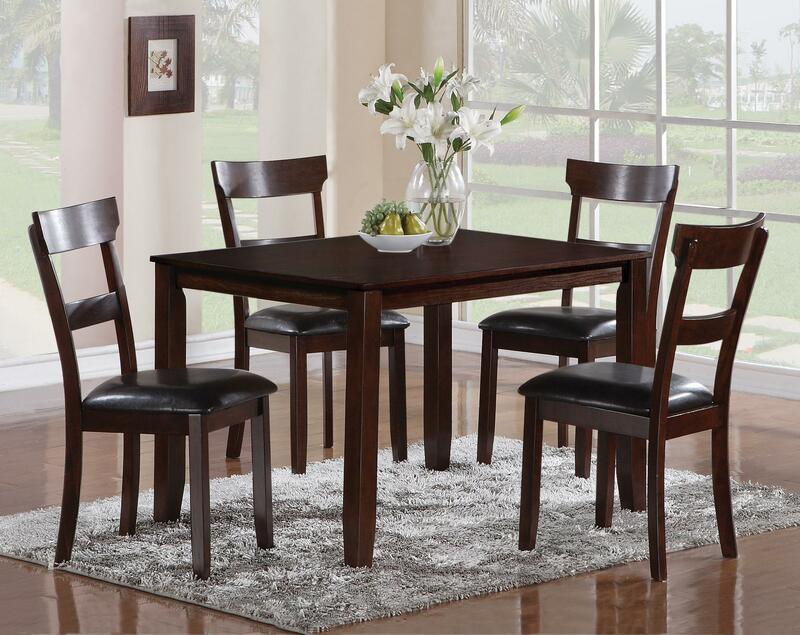 Add understated and functional seating and eating space to the kitchen, dining, and bar area in your home with this five piece dining table and chairs set. The table in this group features a dark brown finish and a rectangular top, on straight tapered block legs. The four included chairs in this set feature upholstered seats in a dark vinyl as well as two chair back slat supports, in a coordinating dark brown finish. This set will add lasting furniture to your home and provide a social space for years to come. The Henderson 5 Piece Dining Table and Chair Set by CM at Michael's Furniture Warehouse in the San Fernando & Los Angeles area. Product availability may vary. Contact us for the most current availability on this product. Finish Warm dark brown finish. Case Detail Block table legs with base tapering, as well as tapered block chair legs. Description: Top Smooth finished rectangular table top.